This is a summary of the weekly notice of operations for the Gwynt y Môr Offshore Windfarm issued on 26th May 2014 to harbour masters and sea users. This notice describes progress with construction, recent operations, work planned for the next 7 days, and provides a list of vessels operating on the site with their contact details. Monopiles: 160 installed. Monopile installation is complete. Export cables: 4 export cables installed; installation is complete. Array cables: 92 array cables installed, 69 remaining. Wind Turbine Generators: 151 installed, 9 remaining. 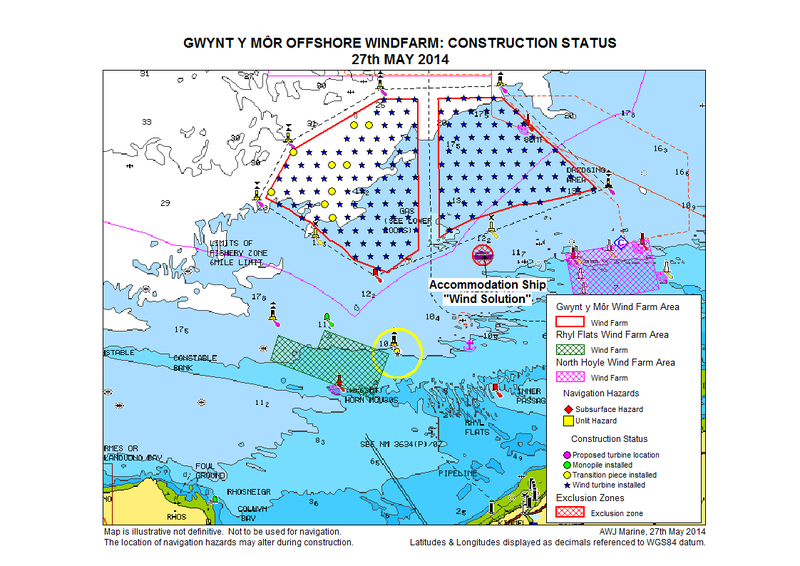 Wind Solution is at anchor position south of Gwynt y Môr (see our previous notice here). Scirocco, Gaillion, Abersoch Bay, Gardian 10, Santa Ana, EMS Viking, Chinook, Bayard 2 and Bayard 5 utilised as Crew Transfer Vessels when required sailing from Canada Dock 3 and Liverpool Marina. Penrhyn Bay, Colwyn Bay, Caernarfon Bay, Gardian, Gardian 2, Iceni Defiant, Athenia, Adventure, Endeavour, Buzzard, Captain P, Commodore P, Kinmel Bay, Cymyran Bay, Aberdaron Bay and Iceni Victory sailed from the Port of Mostyn as required. Penrhos Bay & Tremadoc Bay are on 24 hour cover and being utilised by the Emergency Rescue Team sailing from RWE Pontoon Birkenhead. MCS Zephyr, Developer, Transporter, Commander P and Cwind Alliance sailed from Huskissons Dock as required to assist with cable operations. Normand Tonjer has continued diving operations assisting Polar Prince as required. HBC Supporter continued diving operations at the wind farm. Polar Prince and Polar King continued array cable installation assisted by CTVs Rix Panther and Rix Tiger (see our previous notice here). Sea Worker continued turbine installation, assisted by Sea Bravo & Sea Echo (see our previous notice here). Channel Chieftain VII, Cwind Challenger and Cwind Resolution continued refuelling operations on site based from Mostyn. Cable vessel Sia continued cable installation operations at the wind farm. Sea Breeze and Sea Storm continued operations at Gwynt y Môr Offshore Wind Farm. Fugro Saltaire continued trenching operations and ROV survey work in Gwynt y Môr windfarm. Survey vessel Line continued surveys of array cable routes. Survey vessels Confidante and RV Discovery continued UXO survey operations at the windfarm. DSV Toisa Vigilant continued diving operations at the windfarm. DSV Red7 Tonjer has continued with diving operations, assisting Polar Prince as required. Wind Solution will remain at anchor position to the south of Gwynt y Môr, sailing into Liverpool for shelter as required (see our previous notice here). Sea Worker will continue with wind turbine installation (see our previous notice here). Scirocco, Gaillion, Abersoch Bay, Gardian 10, Santa Ana, Sea Storm, Sea Breeze, EMS Viking, Chinook, Bayard 2 and Bayard 5 will be utilised as Crew Transfer Vessels when required sailing from Canada Dock 3 and Liverpool Marina. Normand Tonjer will continue diving operations including work with the Polar Prince to aid installation of array cables. HBC Supporter will continue diving operations. Isadale will continue performing guard duties and will be used as the Marine Mammal Observation vessel as and when required. Channel Chieftain VII, Cwind Challenger and Cwind Resolution will continue refuelling operations on site based from Mostyn. Cable vessel Sia will continue operations on site. Polar Prince will continue array cable installation with Polar King (see notice to mariners here) assisted by CTVs Rix Panther and Rix Tiger. Fugro Saltaire will continue trenching & survey operations at Gwynt y Môr Offshore Wind Farm. Survey vessel Line will continue surveying operations. Survey vessels Confidante and RV Discovery will continue UXO survey operations (see notice to mariners here). DSV Red7 Tonjer will continue with diving operations, assisting Polar Prince as required. DSV Toisa Vigilant will continue diving operations at the windfarm. The vessels that will be operating on the site over the next 7 days and their contact details are given below. We have linked up the vessel names to MarineTraffic.com so that with just one mouse click you can find out more about their current location and recent activity. All vessels will monitor VHF Channel 16. Cammel Laird Birkenhead/Port of Liverpool. Construction vessels and support vessels may enter Liverpool at short notice to change crew and collect stores. Seatruck Pace will be arriving & departing on a regular basis delivering turbine components. Sea Jack and Sea Worker turbine installation vessels will be arriving & departing on a regular basis to collect turbine components. Crew transfer vessels listed in this notice will be transiting on a daily basis. Channel Chieftain VII Cwind Challenger & Cwind Resolution transiting daily, operating 24 hours. Guard vessel Isadale bunkering fuel when required in Fleetwood. Please contact Jim Andrews, Fishery Liaison Officer by e-mail or phone (+44(0)7908-225865) if you have any queries or concerns about these activities.